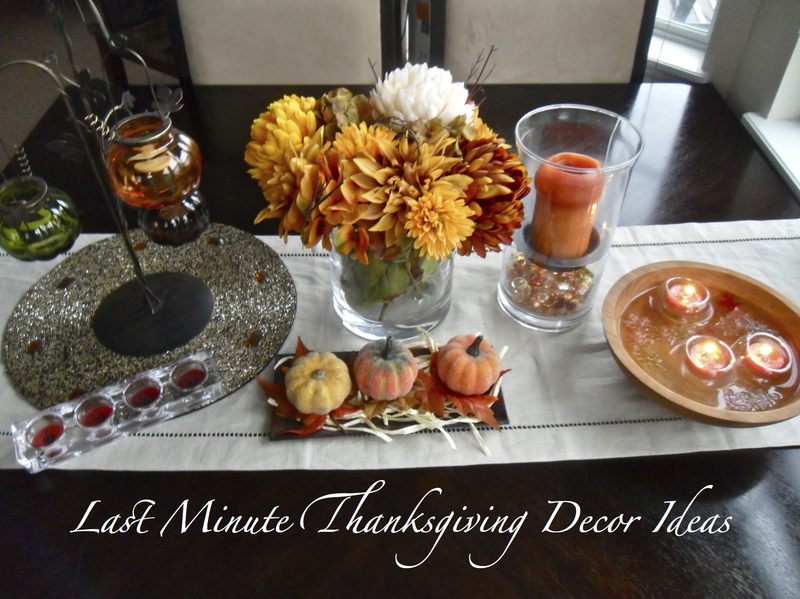 By now I’m hoping everyone has their menus planned so the food part of Thanksgiving is taken care of but I know some of you may be looking for quick and easy ways to decorate your home for the holiday! I did a lot of decor projects for this fall but I’ll dedicate this post to the fastest and easiest ones that you all could do today and have in time for tomorrow! The first one is just a simple hurricane candle that we have in our half bath downstairs. I love the combination of a great smelling candle with a decorative twist so this one is perfect. The glass hurricane comes from target and I just change out the candle and the items in the bottom and use it for every single holiday, I like things I can repurpose and get the most use out of. The leaf and gem filler for the bottom comes from Pier One and is on sale for so cheap right now… Make sure you set a few of the leaves aside for the next decor idea! The next idea I love, floating candles in a really rustic wooden bowl with the leftover plastic leaves from the last project. The bowl is actually our salad bowl and was an amazing wedding gift given to us by my great aunt and uncle from the New Hampshire Bowl & Board. I filled it with water and floated Tea Lights in these amazing little floating tea light holders (mine aren’t the crackled ones but I couldn’t find the exact ones we have on the website, they do have them in the store though!). After that I floated a few of the plastic leaves from the hurricane project in the water. The next project is so simple.. I took an old rectangular candle tray and used a beaded pumpkin kit from Joann Fabrics and layered the hay, some pressed leaves leftover from my Vintage Book Wreath Craft and the pumpkins on top. The last two are really simple ways to decorate small tables. I’m usually not a huge fan of fake flower mostly because I love the real thing, but I found this bouquet at Joann fabrics and fell in love with the colors. We have this amazing bosphorus bowl that I use as a as a vase. The last picture is of a hanging pumpkin lantern that I found at Pier One similar to this one (again I couldn’t find the exact one online but I was just at the store this week and know they still have them). I use our LED Tea Lights inside the pumpkins for an easy safe way to display the lanterns. The whole thing sits on top of a beaded placemat that I got from Pier One last fall. Hope everyone is having fun getting ready for tomorrow and that these ideas give you a little last minute inspiration… happy decorating! !